Welcome to the Card of the Week Contest! 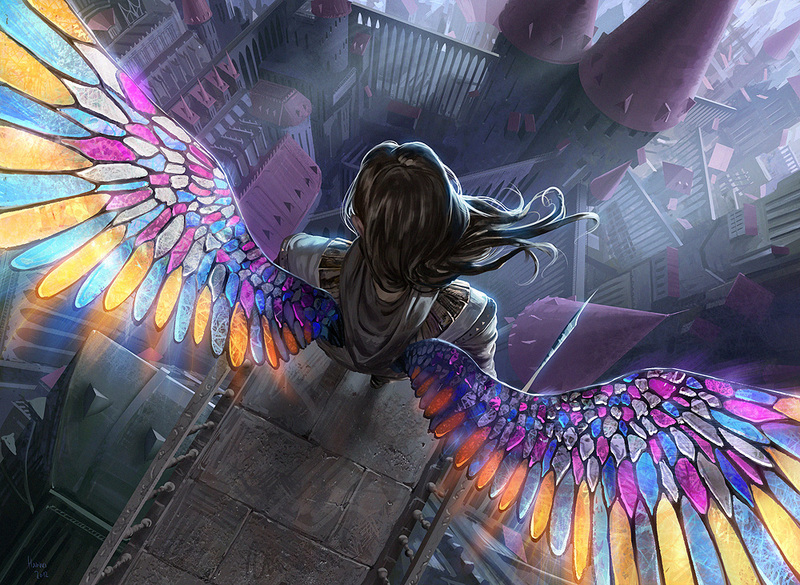 To participate in this Contest you'll have to design a card along the contest guidelines and throw it into the arena with other competitors' entries! At the end of each week, a winner will be determined by forum poll. The winner's card will be rendered and featured on the Welcome page, and the winner decides the challenge for the next week's Contest! Here we go, competitors: our two-hundred and forty-sixth challenge! 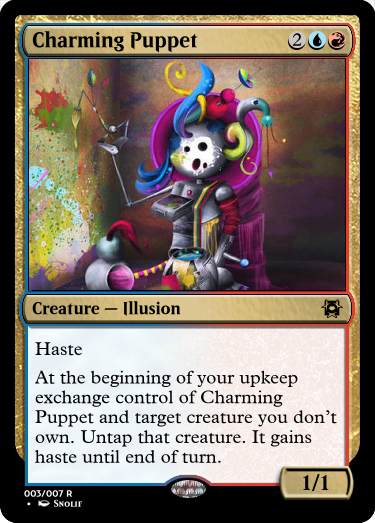 Design a card with "exchange" or "switch" in its rules text. To increase your chances of winning and to also make creating the poll easier on whomever is doing so, please try to use a render. Additionally, please try to keep your entry edits all in one post - if you need to change it you can put your old entry in a spoiler marked "Old entry" and leave the newest rendition to be seen. Just use the edit button in the top/right of your original post. And now, time to begin the challenge! 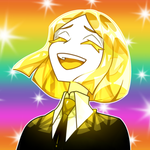 Imma just put what I got here now and look for some fitting art later. Feedback is always appreciated. Now I wonder.. Do I want to keep the more serious entry above, or do I replace it with something completely wacky and meta? 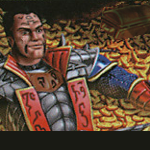 At the beginning of your upkeep, you may have two target players exchange graveyards. "Now, let's see if your backyard has better pickings." 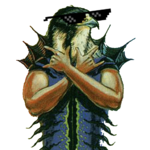 When Avian Imposter deals combat damage to a player, you may exchange control of it and target creature that player controls. 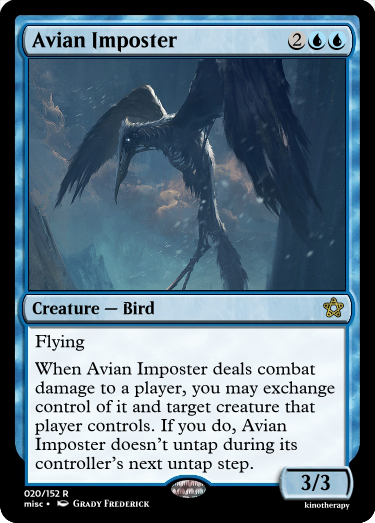 If you do, Avian Imposter doesn’t untap during its controller’s next untap step. In Soviet Mercadia, gift gets you! 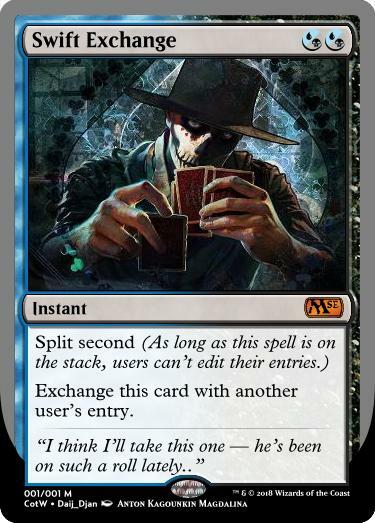 Draw three cards. You lose 2 life. 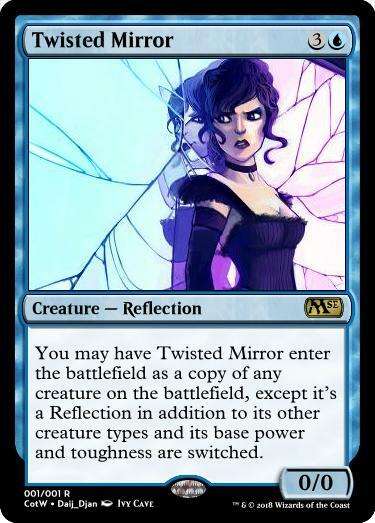 Lore sidenote: I gave the card the Dimir watermark not just because it's Blue-Black, but because I could see this sort of spell existing in their arsenal. 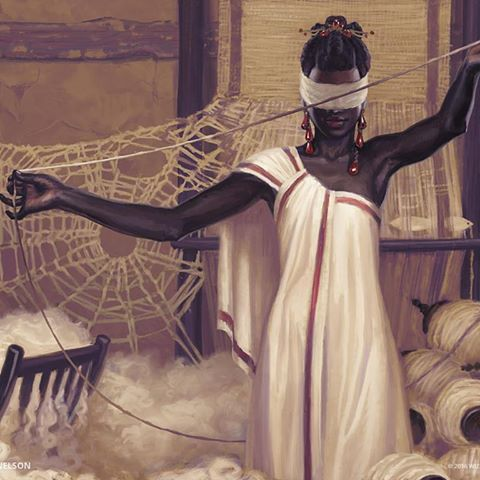 They're more about control through evasion and illusion, but in the event that mind control was used against them, I feel they'd be ready to defend against it and turn it to their advantage. Not even sure if this works. 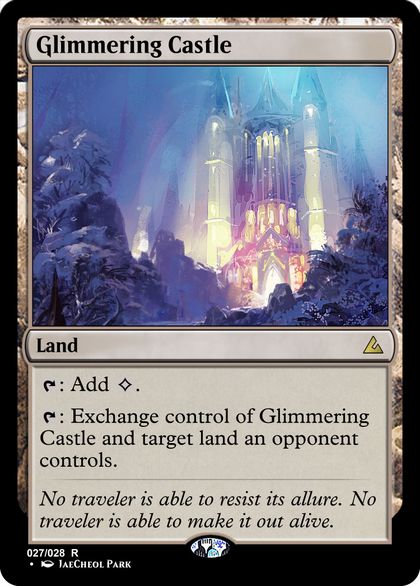 Not saying it's the right way of doing things, but personally, I would go with "Until end of turn, if a spell would have you exchange control of a permanent, gain control of target non-land permanent an opponent controls instead." 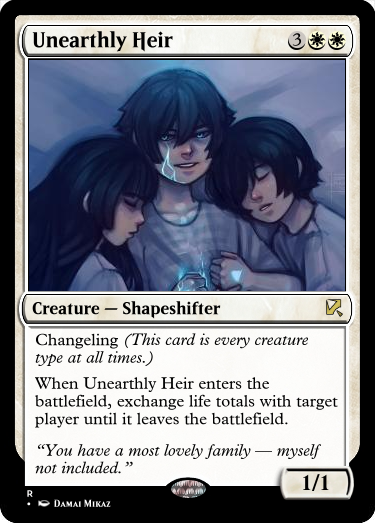 It gives you your timing (until end of turn) and reduces wordiness on your replacement effect. Seems like that might make sense. I'll take a look when I get home. Do it! DO IT!!! I wanna see what happens when this card is used to swap with someone's entry, and this card still wins! Then we'd all hafta pretend that this card was designed by someone else. LET'S MAKE THIS HAPPEN, PEOPLE!! : Exchange control of target creature a player controls and target noncreature permanent another player controls. Activate this ability only during a main phase, and only once per turn. Cardfight Vanguard V-Series update is now finished! Here is my first sketch for an entry for this week. I think I will play on the joke @daij_Djan just made with his card design. One question: When does one use the word "swap" in a sentence, and when does one use "exchange"? To me, they have the same meaning, but I might be mistaken. - Swap the power and toughness of target creature an opponent controls with the power and toughness of target creature you control. - Swap all abilities of target creature an opponent controls with the abilities of target creature you control. 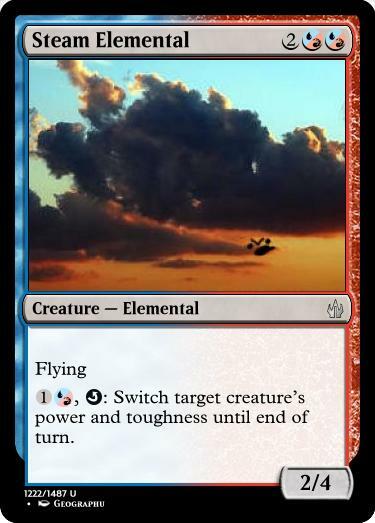 Mahx Michael: "Switch" is used exclusively to swap power and toughness on a single creature. Power and toughness is either switched or it isn't, it doesn't represent a permanent exchange of the values, just that they should be swapped after all other p/t calculations are done. 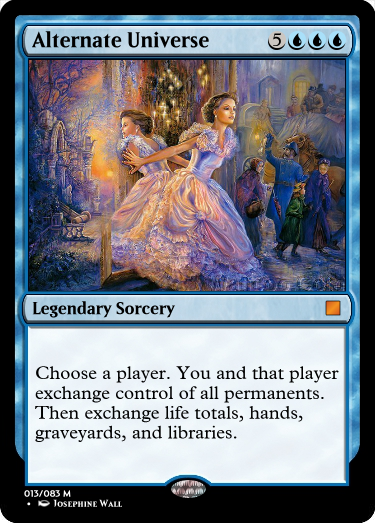 "Exchange" can mean a few different things: it can be used to exchange control of two objects (spells aswell as permanents, see Perplexing Chimera), it can exchange cards in zones other than the battlefield/stack, and it can exchange two values, usually life totals but sometimes power/toughness aswell. Unlike with switch, if you exchange a power/toughness value this way, it becomes the new base power/toughness. For your card, for the first mode I take it that two creatures swap powers with each and swap toughness with each other? (I find it a little hard to follow as written.) 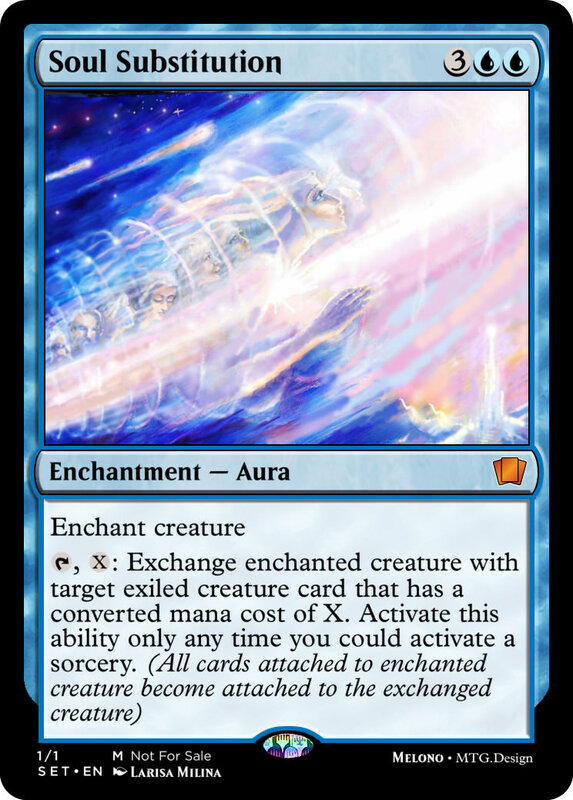 In which case you'd use exchange, as with Serene Master. I'm not sure there's precedence for the second mode but since it's not a p/t switch, use exchange there aswell. Mary O'Kill uses Switch to do something different, but since that's silver bordered I'm not sure how useful it is. If a player didn’t lose unspent mana as steps and phases ended this turn, you may pay instead of ~’s mana cost. 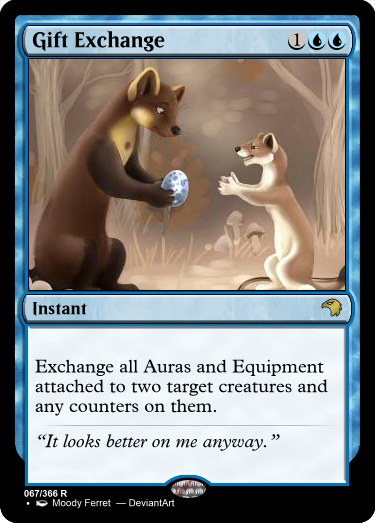 Exchange two target player’s mana. 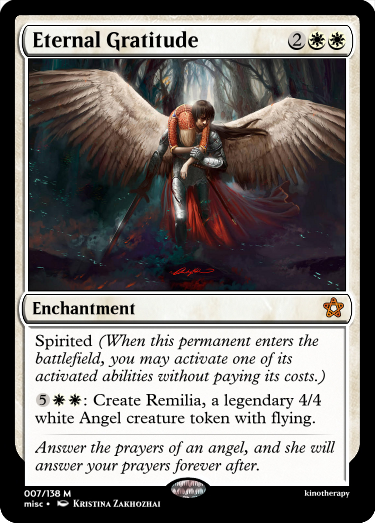 That mana becomes colorless. -Can you exchange mana like this? I’d say yes, because exchanging life totals is a thing and it’s similar- you gain or lose mana/life. -Should this be a trap? It’s such a niche, one-time use I figured why the Hell not, right? Also apparently this is how things are worded since the “mana pool” was phased out. A "bomb" for your chaos EDH deck. Exiling cards from your hand is a special action like flipping a morph. 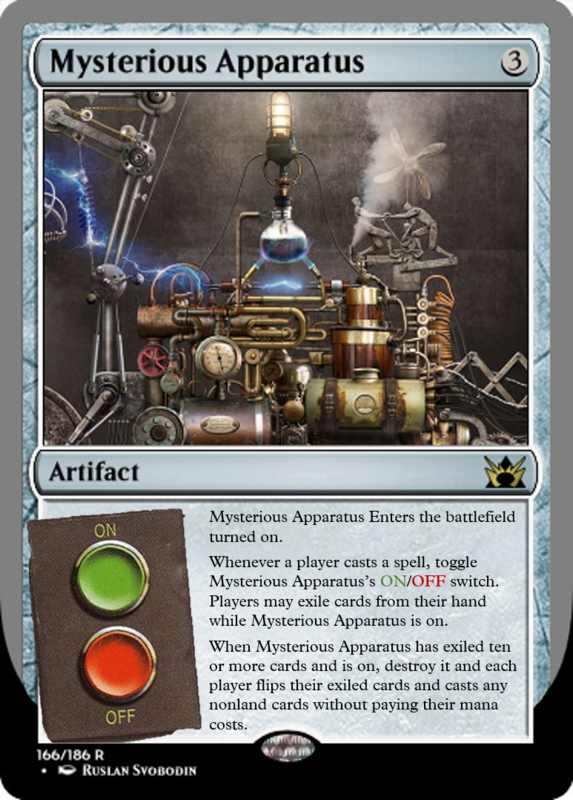 I wanted an activated ability, but i couldn't format it with power point the way I wanted. Choose target permanent an opponent controls, then that player chooses a permanent you control, exchange control of them, any opponent may pay 1 to repeat this process, except they choose first. : Target creature you control with defender loses defender until end of turn. 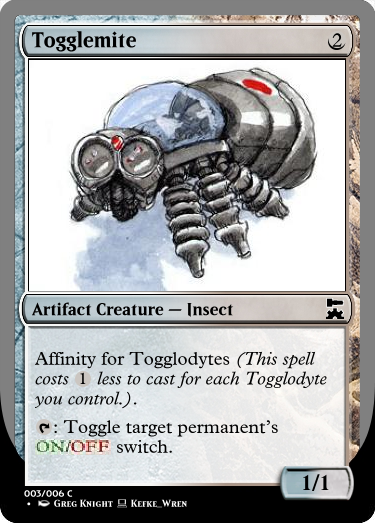 : Switch the power and toughness of target creature you control until end of turn. 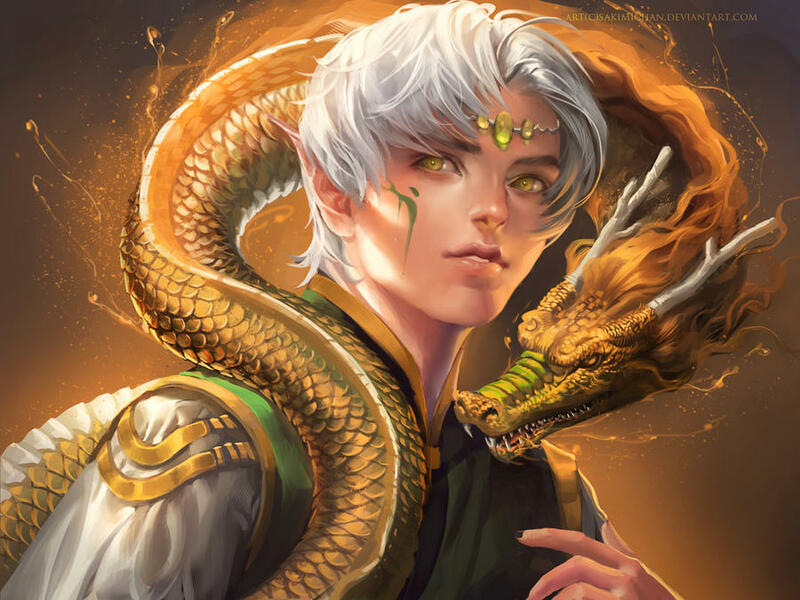 Of all Bant nations, the guardians of Eos command the highest respect. This challenge is now closed - poll and next challenge will be up soon!